Craft Wars on TLC is a new favorite. As a crafter, how could I resist watching? I’m really liking it. As with all of the “competition” type shows, the best part is yelling at the TV, telling the contestants how they can make the project better. It’s like watching football – everyone becomes a quarterback or coach. Even my family joins in, critiquing the projects. In addition to the entertainment, I’ve also gotten some good inspiration from the show. One of my favorite episodes was #5, a Christmas-themed contest. 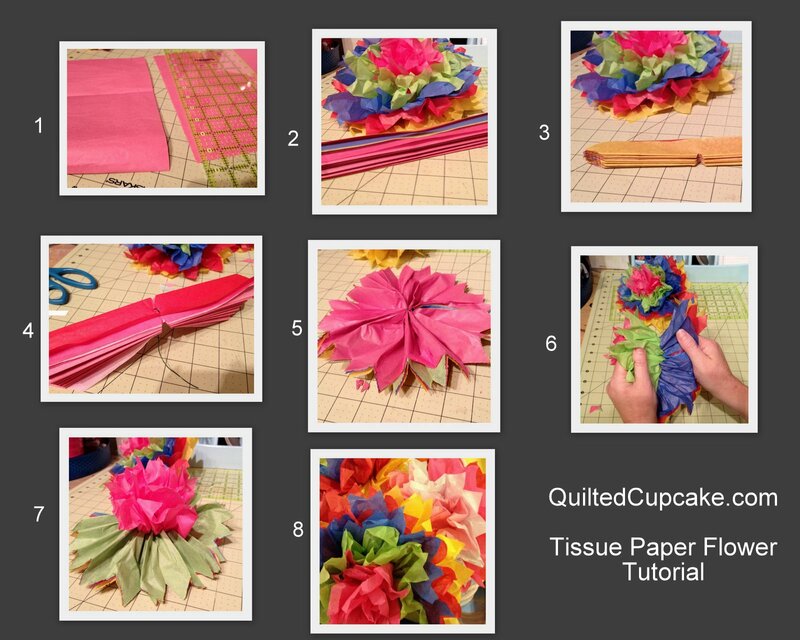 One of the crafters, Marilyn Porter, made these gorgeous tissue paper flowers. I looked for a tutorial by the show, and couldn’t find one. So, I decided to give it a try. I was pretty happy with the results. Especially considering it’s a dollar store craft! Here’s the method I used – you can make the step by step photo larger by clicking on it! Wire (floral or otherwise, sturdy but not too thick) – pipe cleaners work great, too. Layer 5 sheets (or more) tissue paper together. Cut it down the middle. Do an accordion fold of about 1inch all the way to the end. Wrap floral wire (or pipe cleaner) around the middle. Leave extra if you want to later wrap it around a dowel or chopstick for displaying the flowers. Open up the pleats to get a flat rosette. Carefully separate the layers. I found that the method shown here results in the best looking flowers with fewest number of tears. Layer by layer, it starts to come together. Stand back and admire your gorgeous flowers, and get ready to make more – it can get a bit addicting. Now, to figure out what to do with all of these flowers. I’m thinking a bunting, and making up a vase or two. Any other suggestions?